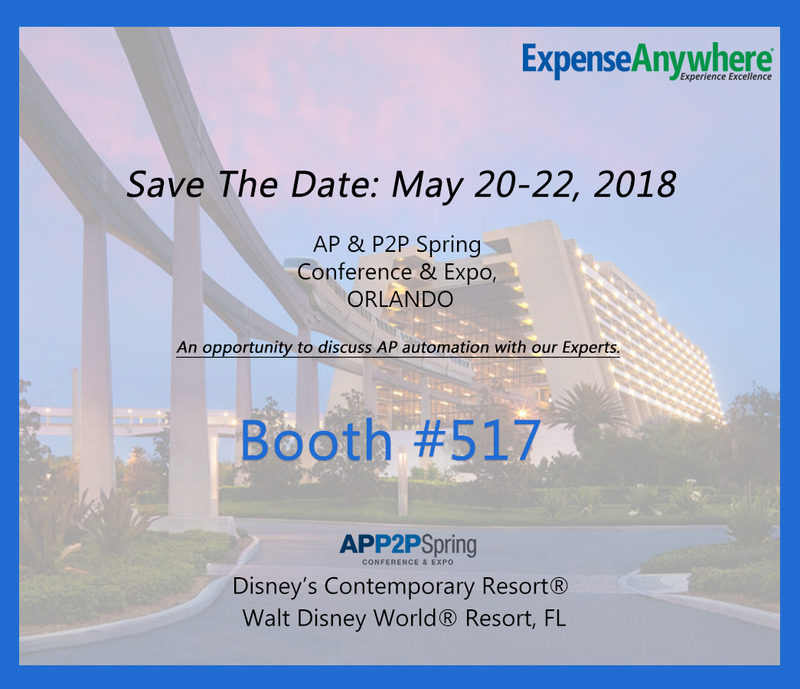 ExpenseAnywhere announces its participation at the AP & P2P Spring Conference & Expo, ORLANDO, MAY 20-22, 2018. Pittsburgh, PA, March 28, 2018 – ExpenseAnywhere announces its participation at the AP & P2P Spring Conference & Expo, ORLANDO, MAY 20-22, 2018. This three-day event will be held at the Disney’s Contemporary Resort, Orlando, FL. At the Conference, we look forward to engaging the finance operations professionals on how their organizations can begin to recognize significant operational efficiencies and cost savings by automating their Accounts Payable processes. InvoiceAnywhere – for complete P2P and supplier invoice management automation. PurchaseAnywhere – for management and reconciliation of P-card and Prepaid card charges. Between these three solutions, businesses can completely automate their total corporate spend outside of their HR costs and reduce their processing costs by as much as 70%. At the Conference, our experts will be on hand to answer your questions and learn how your company can quickly reap the benefits from our proven, world-class solutions that deliver the highest degree of automation with the extremely easy user interface. 1. Industry’s first-ever ONE-CLICK feature that automatically creates an expense report ready for submission in less than 10 seconds, validating itinerary travel data, corporate card charges, and expense receipts with the company policies and instantly itemizing the hotel folio. No touch, no mess, no fuss! 2. The InvoiceAnywhere solution disrupts the status quo of managing invoices traditionally. Our technology solution utilizes the power of OCR based machine learning algorithms together with the artificial intelligence to deliver 100% accurate invoice data. The solution supports 2/3/4-way matching of the invoices, performs real-time sales/use tax audit on each invoice with automatic allocation, approval and dispute resolution and exceptions handling, and many more features, including the vendor payments supporting payments via ACH, Virtual cards, wire transfers and checks. Conference participants are invited to visit us at Booth # 517. ExpenseAnywhere experts will be available for in-booth presentations and discussions throughout the event. Please feel free to call us at 412-858-1111 or e-mail sales@expenseanywhere.com to arrange a prior meeting. ExpenseAnywhere, headquartered in Pittsburgh, PA, and with offices in Canada, Europe, and India, is a world-class provider of cloud-based solutions for Accounts Payable and Procure-to-Pay processes. Our innovative solutions help small to big size companies to save time and money, mitigate risks and fraud and make more informed decisions on company’s spend and cash flow. Our automated AP and P2P solutions are innovative and ensure a huge ROI to your Company.